The year is quickly coming to a close. The 2016 Verizon IndyCar Series season is now further away from us than the 2017 season, which is a good thing. This past season gave us a new champion in Simon Pagenaud, but it also showed that the old wily drivers still have plenty of fight left in them. Next season should be even more interesting, with Josef Newgarden replacing Juan Montoya at Team Penske, with Montoya rejoining the team for the Indianapolis 500; Chip Ganassi Racing switching to Honda and a sort of driver swap between Andretti Autosport and AJ Foyt Enterprises. If the chill of December is getting to you, just remember this – once the ball drops in Times Square on New Year’s Eve, we will be less than two and a half months away from the start of the drop of the green flag at St. Petersburg. That should warm you up a little. But we need to get through the holidays before that. With Christmas just a few days away, it’s time for me to push away from the keyboard for a little while and take my traditional Christmas break. Traffic on this site drops dramatically in December anyway and it helps to recharge my batteries for the New Year. It seems like once January hits, racing quickly gets back in everyone’s minds. So I’ll be taking a couple of weeks away from here. This will be my last post here until Wednesday Jan 4, when I’ll return with more ramblings and incoherent thoughts regarding the Verizon IndyCar Series. Until then, Susan and I wish everyone a safe and Merry Christmas as well as a prosperous and Happy New Year! Thanks to all of you for reading Oilpressure.com over the years, and we look forward to even more fun here next year. This entry was posted on December 21, 2016 at 4:04 am and is filed under IndyCar. You can follow any responses to this entry through the RSS 2.0 feed. You can leave a response, or trackback from your own site. Thanks for the words this year especially helped with our first Indy 500 visit. Merry Christmas and a Happy New Year to you and yours. Merry Christmas to you and Susan. Lots of positive things happened for the IndyCar series in 2016. Thanks for your reporting and perspective on the sport. Now kick back, grab a beverage of your choice and enjoy the Titan’s run. Cool card. Merry Christmas George and Susan. Encouraging words to get through the long winter offseason and the holidays. I am going to wish for more teams for IndyCar. A very Merry Cristmas and a Happy New Year to both and your extended families wherever they may be. Have a wonderful Christmas you all. Thanks for keeping us fans engaged in the sport, in and out of season. Have a wonderful holiday, one and all! Thanks George for all your posts throughout 2016. I look forward to every one. I hope you and Susan have a relaxing and enjoyable few weeks. My last physical day at work is tomorrow. I am taking early retirement! This will give me more time to actually read posts the actual morning they are available. Now that is a novel idea. From one retired person to another: Sleep late, read Oil Pressure, take a nap. Sounds like a perfect day to me. Thanks. Nice time of the year to thank the folks at Oil Pressure for a great website. Thanks Ed. I intend to enjoy life for a change and stay off the freeways during rush hour. Have a happy Christmas. 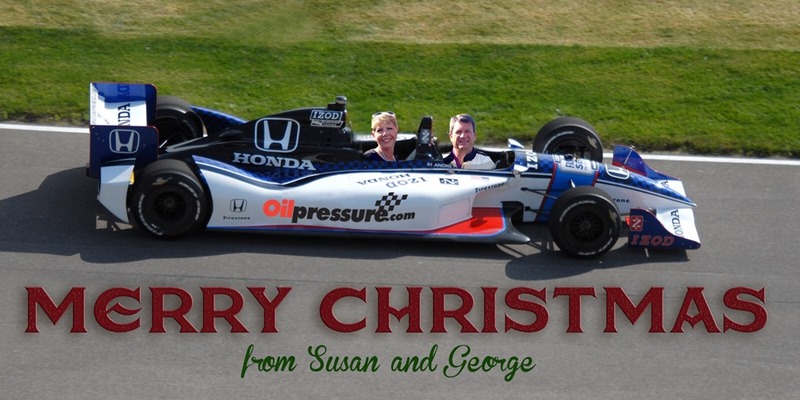 Merry Christmas and Happy New Year George and Susan. Ejoy the break. I will look forward to reading Oilpressure again in a few weeks. Thanks for blogging, George and Susan. Be safe. See you next year. Great blogging as always & Merry Xmas.